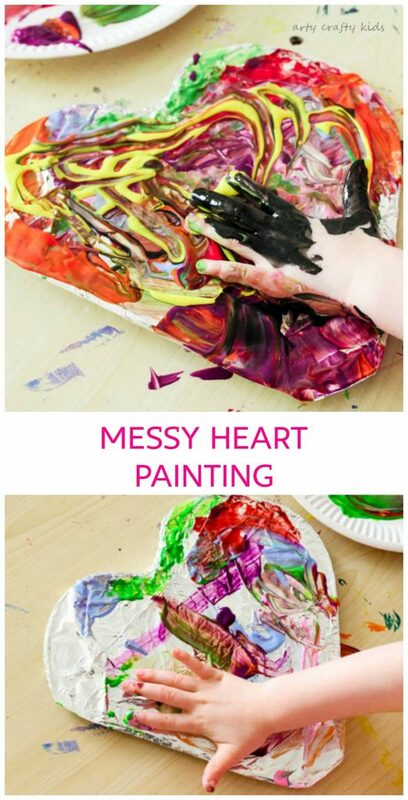 What’s not to love about this super fun, super easy Messy Heart Painting art project!?! With a set-up of time of LESS than 5 minutes using materials you’re likely to already have at home, this is the PERFECT activity to have in the back pocket for rainy days. 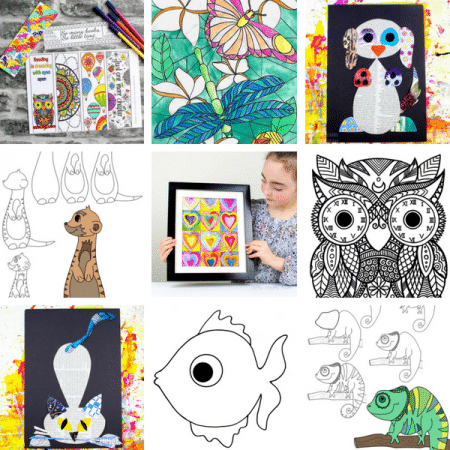 And I can guarantee, you’re kids – little or big – will love it! 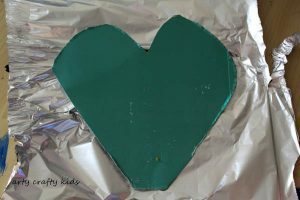 To create the heart canvas, simply grab an old cardboard box and cut out a heart shape. Next, wrap it with tinfoil. 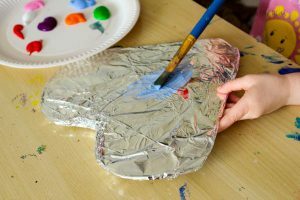 Depending on how perfectionist you are, you could either smooth it out or leave a few bumps and creases for a little extra sensory fun. 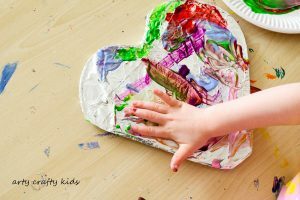 Set up the paint and start with a paintbrush or get creative and offer a q-tip, a clothes peg with a pom-pom, yarn or any other household item that might be fun to paint with. 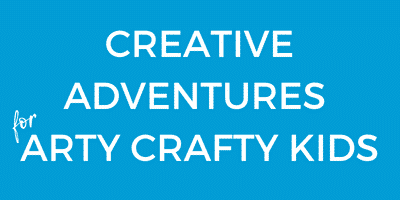 And then, just leave the kiddos to it and see what they do! 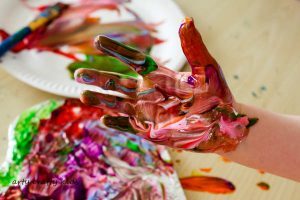 My kids will often skip the paintbrush and dive straight in with their hands. 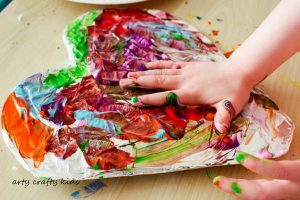 When we try this activity again, I will certainly get more creative and perhaps offer some natural paintbrushes made up of leaves and flowers as an alternative. If you would like to add an educational ‘pre-writing’ slant to this activity, you could offer your child some images of letters, shapes or numbers for them to copy. Or like us, just stick to having some messy fun. 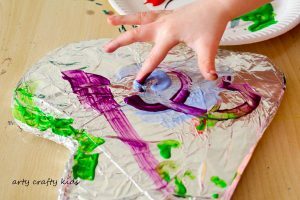 My little girl loved moving the paint over the tinfoil canvas, smoothing out the bumps while mixing the paint. And loved reviewing the “pretty paintings” left on her hands. 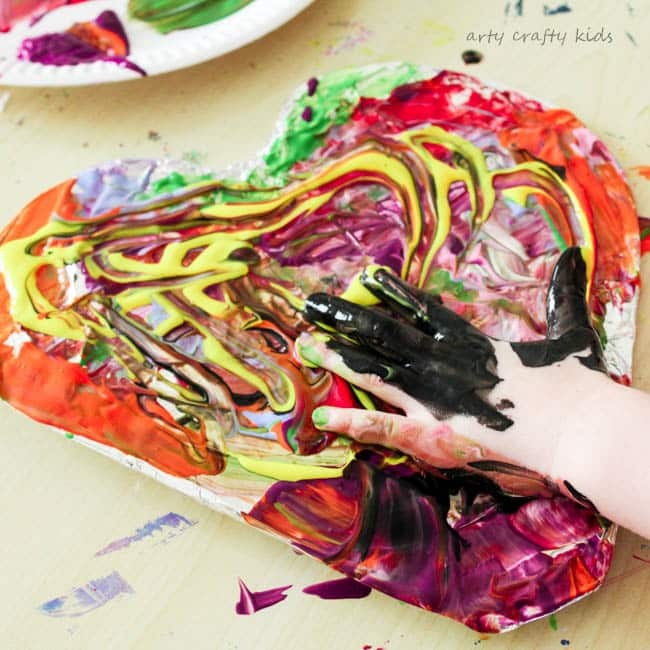 For such a simple activity, our messy hearts offers oodles of open-ended play for kids – from colour mixing, sensory process art to becoming a fun pre-writing activity. 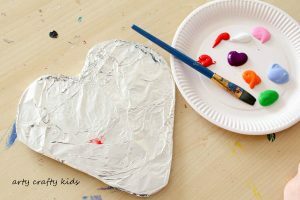 However your child adapts this activity, as they are likely to have their own ideas, I hope they love the process and have lots of fun with it! 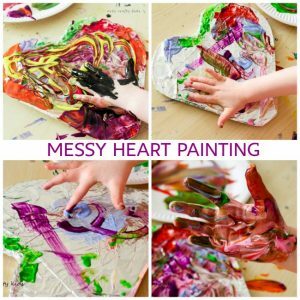 For more process art ideas take a look at our watercolour heart painting, yarn art and splatter painting!